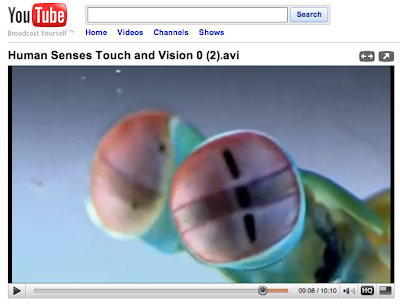 PBS is currently running a series entitled "Human Senses" and the most recent episode featured none other than our previously blogged friend and polarizing figure, the ultra-percieving mantis shrimp. It's quite something to actually see its remarkable pair of multi-channel photon detectors in action. This episode will be repeated in the San Francisco Area tonight at 11:00PM on KQEDW (Digital 9.3). Elsewhere, check your local listings.